In north Florida, water softeners have consistently been used to help improve the overall quality of water for households and businesses. And over the last few years, awareness has grown to include ultraviolet water treatment systems. This superior-quality UV water treatment system in Florida completely disinfects water through the use of powerful ultraviolet light – eliminating harmful bacteria and viruses. One of our most cost-effective ultraviolet systems – the Sterilight Cobalt™ series – provides pure, healthy drinking water for your home or business. The Sterilight Cobalt™ is designed and tested to ensure instant, high-quality drinking water right from your faucet. 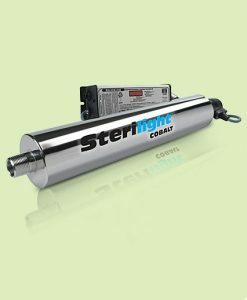 Sterilight Cobalt Series UV/Filter systems can be used even when your drinking water requires additional filtering. Eliminating particles and reducing unpleasant odors and taste these systems come equipped with sediment and carbon filters.